The word it’s only has an apostrophe when it is a contraction of it is or it has. The film was poor, I’m glad it’s finished. Now I can ride a bike, it’s easy! Possessive pronouns: mine, yours, his, hers, its, our, theirs. Determiners: my, your, his, her, its, our, their. These words do give an indication of belonging or possession, and some of them end in -s, but they never have an apostrophe. So, if you are not sure whether to write its or it’s, simply substitute the words ”it is“. As a rule of thumb, if the sentence still makes sense then you can still use the apostrophe, otherwise leave it out. Find all the number 7’s on this page. Put a circle round all the t’s in tittle-tattle. An apostrophe is used to show that a person or object belongs or relates to someone or something. Instead of saying “the mother of Sally” or “the rays of the Sun” we simply say Sally’s mother or the Sun’s rays. The party was at Pete’s house. The dog’s bowl was empty. Mum’s car broke down on the way home from town. Last Friday’s concert was excellent. The nurse worked at St. James’s hospital in Leeds. Charles’s brother is a professional footballer. A Christmas Carol was the shortest of Dickens’ novels. Wesley Snipes’ best film was probably Demolition Man. Edward borrowed his parents’ car. Just inside the door was the ladies’ cloakroom. Footballers’ wives sit together to watch the game. The men’s cloakroom was at the end of the corridor. The children’s centre is closed on Saturdays. Top Shop sells women’s clothing. Apostrophes are used to show that some letters have been missed out. This usually happens when two words are run together to make a single word. This is called a contraction and happens quite a lot – particularly in spoken English. This being the case, students will find that they use this type of apostrophe most often in their writing when they are using direct speech. There is a case for suggesting that, unless they are using direct speech, contractions should be avoided. We’ll – short for we will. We’ll get a dog when we move into our new house. I’m – short for I am. I’m happy that l can have tomorrow off work. I’d – short for I would. I’d like fish and chips for tea, please. Can’t – short for can not. Mum can’t afford a new car just yet. Didn’t – short for did not. Jenny didn’t go to the party on Saturday. 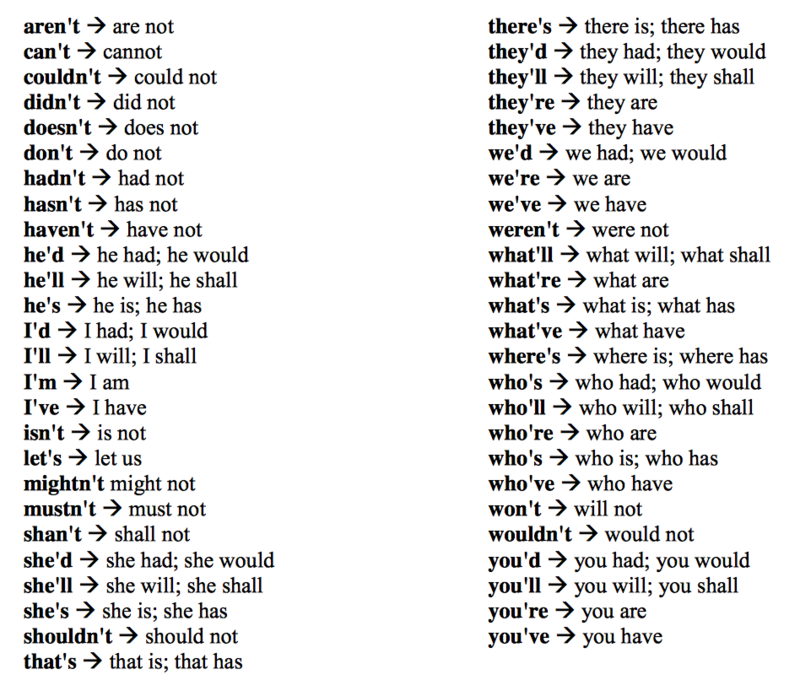 There are many other examples of contractions and the way in which apostrophes are used to indicate where letters have been omitted. Click here to see a list of words that use an apostrophe to indicate that there is a letter or letters missing. Can you remember the summer of ’69? I was in Berlin when the wall fell in ’89. The colon has three main uses as a punctuation mark. Mary had four dogs: a labrador, a German shepherd, a boxer and an old mongrel called Jess. There are four meals available to chose from at the event: pizza, curry, spaghetti bolognese and omelette. A colon is not needed if the list is incorporated in the sentence. The restaurant specialises in pizza, pasta and rice dishes. A colon is used to separate two independent clauses when the second clause is an explanation or example of the first. John could not go out on Friday night: he had no money. At the start of the match there were three possible outcomes: we could win and be promoted or we could either lose or draw, in which case we would not. A colon can be used to emphasise a word or phrase at the end of a sentence in a way which is more or less in line with the way the colon separates clauses in that the words after the colon provide an explanation of what has gone before. Standing on the cliff edge there was only one thing that Butch and Sundance could do: jump. As the aircraft was thrown about in the turbulence, there was only one place mum wanted to be: back on the ground. Ouch! You trod on my toe. Oi! Get out of my garden. “Look out!” shouted dad as he dropped the hammer. ”Get down from there!” yelled the teacher when he saw the boys climbing the tree. When the clown appeared at the party all the children burst out crying! There has, lately, been a trend in informal wnting to place multiple exclamation marks in writing, especially in social media.